Aphids are small parasitic bugs that attach themselves to plants, usually the undersides of leaves, and drain the plants of their moisture. They also leave behind a sticky substance on the plants that cause other parts of the plant to mold and rot. 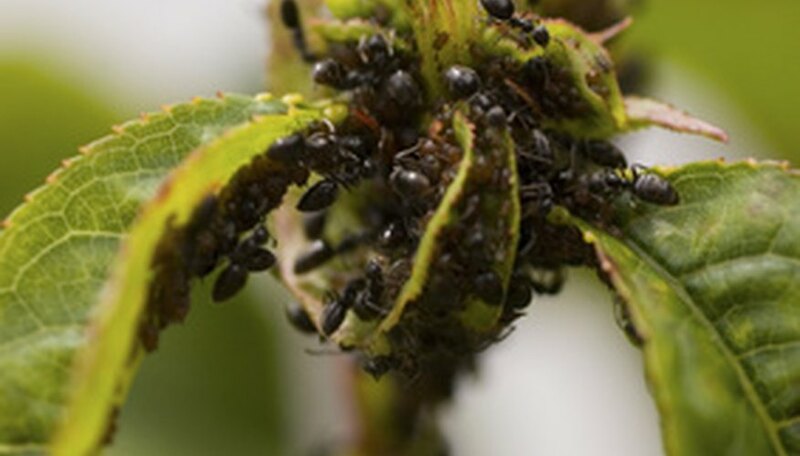 Aphids may be controlled if their colonies are found early and destroyed quickly. Instead of using store-bought pesticides that could harm the plant, make a homemade version that is much safer for both the plants and the environment. Check plants often for aphids. Be sure to look on the undersides of leaves. Signs of aphid infestation include curled leaves, drying leaves, a web-like substance and rotting on the plant. To avoid attracting aphids, do not overfertilize gardens and plants. Plant garlic and onions, which discourage aphids, near plants that require protection. Mix a homemade bug spray to kill the aphids. Combine 1 quart water, 1 cup vegetable oil and 2 tbsp. of dish soap in a bowl and pour it into a spray bottle. Spray this mixture directly on the aphid colonies in the garden. The soap dehydrates the bugs, killing them. Water the plants with a spray hose after treatment before the plants are exposed to bright sunlight. The vegetable oil can draw in sunlight and burn the plants. Make a mixture of soapy water in the kitchen sink for houseplants that have been affected by aphids. Mix 1 tbsp. of dish soap in the water, dip the plant in, then let it dry. Once the water and soap mixture had dried, rinse the plant.